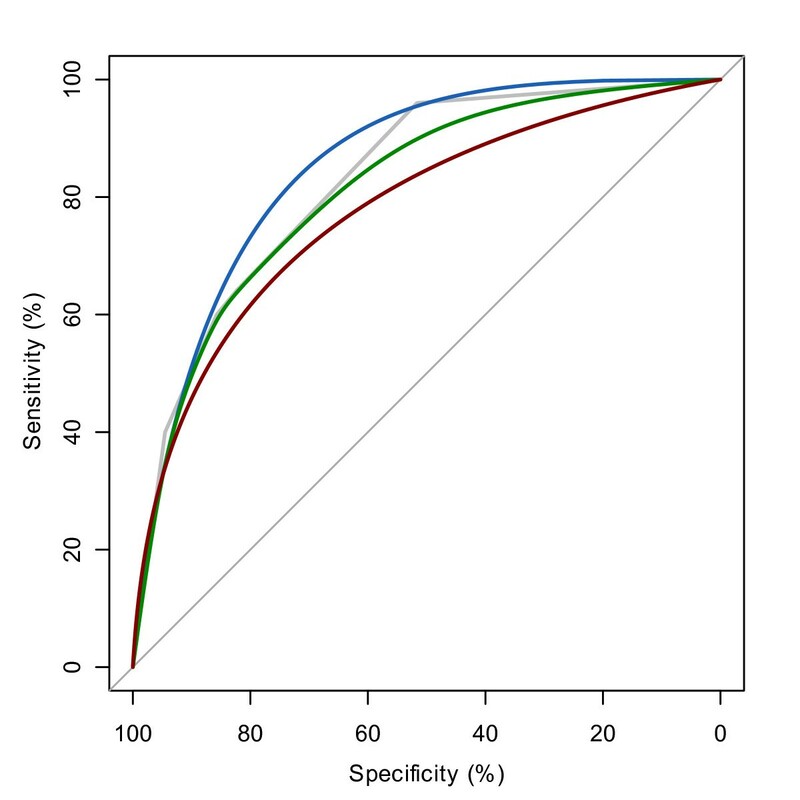 Receiver operating characteristic (ROC) curves are useful tools to evaluate classifiers in biomedical and bioinformatics applications. However, conclusions are often reached through inconsistent use or insufficient statistical analysis. 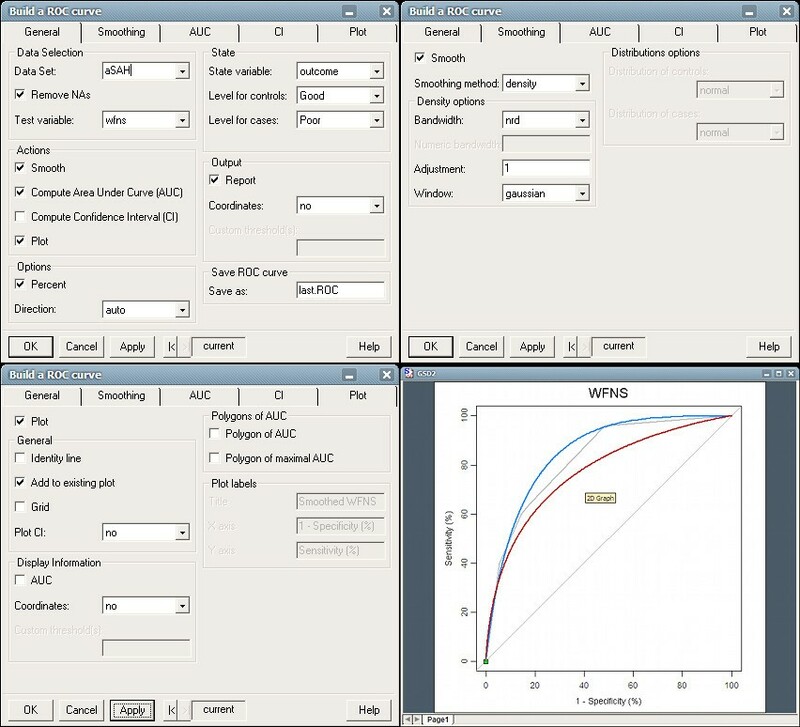 To support researchers in their ROC curves analysis we developed pROC, a package for R and S+ that contains a set of tools displaying, analyzing, smoothing and comparing ROC curves in a user-friendly, object-oriented and flexible interface. With data previously imported into the R or S+ environment, the pROC package builds ROC curves and includes functions for computing confidence intervals, statistical tests for comparing total or partial area under the curve or the operating points of different classifiers, and methods for smoothing ROC curves. Intermediary and final results are visualised in user-friendly interfaces. A case study based on published clinical and biomarker data shows how to perform a typical ROC analysis with pROC. pROC is a package for R and S+ specifically dedicated to ROC analysis. It proposes multiple statistical tests to compare ROC curves, and in particular partial areas under the curve, allowing proper ROC interpretation. pROC is available in two versions: in the R programming language or with a graphical user interface in the S+ statistical software. It is accessible at http://expasy.org/tools/pROC/ under the GNU General Public License. It is also distributed through the CRAN and CSAN public repositories, facilitating its installation. A ROC plot displays the performance of a binary classification method with continuous or discrete ordinal output. It shows the sensitivity (the proportion of correctly classified positive observations) and specificity (the proportion of correctly classified negative observations) as the output threshold is moved over the range of all possible values. ROC curves do not depend on class probabilities, facilitating their interpretation and comparison across different data sets. Originally invented for the detection of radar signals, they were soon applied to psychology  and medical fields such as radiology . They are now commonly used in medical decision making, bioinformatics, data mining and machine learning, evaluating biomarker performances or comparing scoring methods [2, 4]. In the ROC context, the area under the curve (AUC) measures the performance of a classifier and is frequently applied for method comparison. A higher AUC means a better classification. However, comparison between AUCs is often performed without a proper statistical analysis partially due to the lack of relevant, accessible and easy-to-use tools providing such tests. 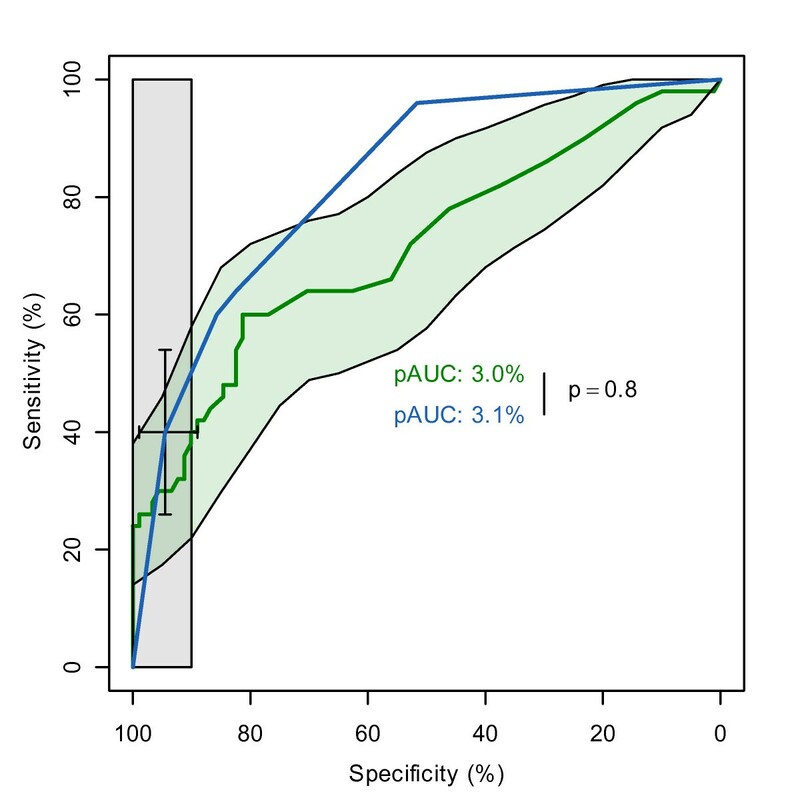 Small differences in AUCs can be significant if ROC curves are strongly correlated, and without statistical testing two AUCs can be incorrectly labelled as similar. In contrast a larger difference can be non significant in small samples, as shown by Hanczar et al., who also provide an analytical expression for the variance of AUC's as a function of the sample size. We recently identified this lack of proper statistical comparison as a potential cause for the poor acceptance of biomarkers as diagnostic tools in medical applications . Evaluating a classifier by means of total AUC is not suitable when the performance assessment only takes place in high specificity or high sensitivity regions . To account for these cases, the partial AUC (pAUC) was introduced as a local comparative approach that focuses only on a portion of the ROC curve [7–9]. Software for ROC analysis already exists. A previous review  compared eight ROC programs and found that there is a need for a tool performing valid and standardized statistical tests with good data import and plot functions. ROCR  provides tools computing the performance of predictions by means of precision/recall plots, lift charts, cost curves as well as ROC plots and AUCs. Confidence intervals (CI) are supported for ROC analysis but the user must supply the bootstrapped curves. The verification package  is not specifically aimed at ROC analysis; nonetheless it can plot ROC curves, compute the AUC and smooth a ROC curve with the binomial model. A Wilcoxon test for a single ROC curve is also implemented, but no test comparing two ROC curves is included. Bioconductor includes the ROC package  which can only compute the AUC and plot the ROC curve. Pcvsuite  is an advanced package for ROC curves which features advanced functions such as covariate adjustment and ROC regression. It was originally designed for Stata and ported to R. It is not available on the CRAN (comprehensive R archive network), but can be downloaded for Windows and MacOS from http://labs.fhcrc.org/pepe/dabs/rocbasic.html. Table 1 summarizes the differences between these packages. Only pcvsuite enables the statistical comparison between two ROC curves. Pcvsuite, ROCR and ROC can compute AUC or pAUC, but the pAUC can only be defined as a portion of specificity. The pROC package was designed in order to facilitate ROC curve analysis and apply proper statistical tests for their comparison. It provides a consistent and user-friendly set of functions building and plotting a ROC curve, several methods smoothing the curve, computing the full or partial AUC over any range of specificity or sensitivity, as well as computing and visualizing various CIs. It includes tests for the statistical comparison of two ROC curves as well as their AUCs and pAUCs. The software comes with an extensive documentation and relies on the underlying R and S+ systems for data input and plots. Finally, a graphical user interface (GUI) was developed for S+ for users unfamiliar with programming. where min is the pAUC over the same region of the diagonal ROC curve, and max is the pAUC over the same region of the perfect ROC curve. The result is a standardized pAUC which is always 1 for a perfect ROC curve and 0.5 for a non-discriminant ROC curve, whatever the partial region defined. Two ROC curves are "paired" (or sometimes termed "correlated" in the literature) if they derive from multiple measurements on the same sample. Several tests exist to compare paired [16–22] or unpaired  ROC curves. The comparison can be based on AUC [16–19, 21], ROC shape [20, 22, 23], a given specificity  or confidence bands [3, 24]. Several tests are implemented in pROC. Three of them are implemented without modification from the literature [17, 20, 23], and the others are based on the bootstrap percentile method. where θ1 and θ2 are the two (partial) AUCs. Unlike Hanley and McNeil, we compute sd(θ1 - θ2) with N (defaults to 2000) bootstrap replicates. In each replicate r, the original measurements are resampled with replacement; both new ROC curves corresponding to this new sample are built, the resampled AUCs θ1,rand θ2,rand their difference D r = θ1,r- θ2,rare computed. Finally, we compute sd(θ1 - θ2) = sd(D). As Z approximately follows a normal distribution, one or two-tailed p-values are calculated accordingly. This bootstrap test is very flexible and can be applied to AUC, pAUC and smoothed ROC curves. Bootstrap is stratified by default; in this case the same number of case and control observations than in the original sample will be selected in each bootstrap replicate. Stratification can be disabled and observations will be resampled regardless of their class labels. Repeats for the bootstrap and progress bars are handled by the plyr package . The second method to compare AUCs implemented in pROC was developed by DeLong et al. based on U-statistics theory and asymptotic normality. As this test does not require bootstrapping, it runs significantly faster, but it cannot handle pAUC or smoothed ROC curves. For both tests, since the variance depends on the covariance of the ROC curves (Equation 3), strongly correlated ROC curves can have similar AUC values and still be significantly different. Venkatraman and Begg  and Venkatraman  introduced tests to compare two actual ROC curves as opposed to their respective AUCs. Their method evaluates the integrated absolute difference between the two ROC curves, and a permutation distribution is generated to compute the statistical significance of this difference. As the measurements leading to the two ROC curves may be performed on different scales, they are not generally exchangeable between two samples. Therefore, the permutations are based on ranks, and ranks are recomputed as described in  to break the ties generated by the permutation. Finally a test based on bootstrap is implemented to compare the ROC curve at a given level of specificity or sensitivity as proposed by Pepe et al.. It works similar to the (p)AUC test, but instead of computing the (p)AUC at each iteration, the sensitivity (or specificity) corresponding to the given specificity (or respectively sensitivity) is computed. This test is equivalent to a pAUC test with a very small pAUC range. CIs are computed with Delong's method  for AUCs and with bootstrap for pAUCs . The CIs of the thresholds or the sensitivity and specificity values are computed with bootstrap resampling and the averaging methods described by Fawcett . In all bootstrap CIs, patients are resampled and the modified curve is built before the statistics of interest is computed. As in the bootstrap comparison test, the resampling is done in a stratified manner by default. Several methods to smooth a ROC curve are also implemented. Binormal smoothing relies on the assumption that there exists a monotone transformation to make both case and control values normally distributed . Under this condition a simple linear relationship (Equation 4) holds between the normal quantile function (φ) values of sensitivities and specificities. In our implementation, a linear regression between all quantile values defines a and b, which then define the smoothed curve. This is different from the method described by Metz et al. who use maximum likelihood estimation of a and b. Binormal smoothing was previously shown to be robust and to provide good fits in many situations even when the deviation from basic assumptions is quite strong . For continuous data we also include methods for kernel (density) smoothing , or to fit various known distributions to the class densities with fitdistr in the MASS package . If a user would like to run a custom smoothing algorithm that is optimized for the analysed data, then pROC also accepts class densities or the customized smoothing function as input. CI and statistical tests of smoothed AUCs are done with bootstrap. We first evaluate the accuracy of the ROC comparison tests. Results in Additional File 1 show that all unpaired tests give uniform p-values under a null hypothesis (Additional Files 1 and 2) and that there is a very good correlation between DeLong's and bootstrap tests (Additional Files 1 and 3). The relation between Venkatraman's and the other tests is also investigated (Additional Files 1 and 4). We now present how to perform a typical ROC analysis with pROC. In a recent study , we analyzed the level of several biomarkers in the blood of patients at hospital admission after aneurysmal subarachnoid haemorrhage (aSAH) to predict the 6-month outcome. The 141 patients collected were classified according to their outcome with a standard neurological scale, the Glasgow outcome scale (GOS). The biomarker performances were compared with the well established neurological scale of the World Federation of Neurological Surgeons (WFNS), also obtained at admission. The purpose of the case presented here is to identify patients at risk of poor post-aSAH outcome, as they require specific healthcare management; therefore the clinical test must be highly specific. Detailed results of the study are reported in . We only outline the features relevant to the ROC analysis. ROC curves were generated in pROC for five biomarkers (H-FABP, S100β, Troponin I, NKDA and UFD-1) and three clinical factors (WFNS, Modified Fisher score and age). Since we are interested in a clinical test with a high specificity, we focused on partial AUC between 90% and 100% specificity. ROC curves of WFNS and S100β. ROC curves of WFNS (blue) and S100β (green). The black bars are the confidence intervals of WFNS for the threshold 4.5 and the light green area is the confidence interval shape of S100β. The vertical light grey shape corresponds to the pAUC region. The pAUC of both empirical curves is printed in the middle of the plot, with the p-value of the difference computed by a bootstrap test on the right. In the rest of this paper, we report only not standardized pAUCs. The confidence intervals of a threshold or of a predefined level of sensitivity or specificity answer different questions. For instance, it would be wrong to compute the CI of the threshold 4.5 and report only the CI bound of sensitivity without reporting the CI bound of specificity as well. Similarly, determining the sensitivity and specificity of the cut-off 4.5 and then computing both CIs separately would also be inaccurate. The second best pAUC is that of S100β with 3.0%. The difference to WFNS is very small and the bootstrap test of pROC indicates that it is not significant (p = 0.8, Figure 1). Surprisingly, a Venkatraman's test (over the total ROC curve) indicates a difference in the shape of the ROC curves (p = 0.004), and indeed a test evaluating pAUCs in the high sensitivity region (90-100% sensitivity) would highlight a significant difference (p = 0.005, pAUC = 4.3 and 1.4 for WFNS and S100β respectively). However, since we are not interested in the high sensitivity region of the AUC there is no significant difference between WFNS and S100β. In pROC pairwise comparison of ROC curves is implemented. Multiple testing is not accounted for and in the event of running several tests, the user is reminded that as with any statistical test, multiple tests should be performed with care, and if necessary appropriate corrections should be applied . The normal fitting (red) gives a significantly lower AUC estimate (Δ = -5.1, p = 0.0006, Bootstrap test). This difference is due to the non-normality of WFNS. Distribution fitting can be very powerful when there is a clear knowledge of the underlying distributions, but should be avoided in other contexts. The density (green) smoothing also produces a lower (Δ = -1.5, p = 6*10-7) AUC. It is interesting to note that even with a smaller difference in AUCs, the p-value can be more significant due to a higher covariance. The binormal smoothing (blue) gives a slightly but not significantly higher AUC than the empirical ROC curve (Δ = +2.4, p = 0.3). It is probably the best of the 3 smoothing estimates in this case (as mentioned earlier we were expecting a higher AUC as the empirical AUC of WFNS was underestimated). For comparison, Additional File 5 displays both our implementation of binormal smoothing with the one implemented in pcvsuite . ROC curve of WFNS and smoothing. Empirical ROC curve of WFNS is shown in grey with three smoothing methods: binormal (blue), density (green) and normal distribution fit (red). Figure 3 shows how to create a plot with multiple smoothed curves with pROC in S+. One loads the pROC library within S+, selects the new ROC curve item in the Statistics menu, selects the data on which the analysis is to be performed, and then moves to the Smoothing tab to set parameters for smoothing. Screenshot of pROC in S+ for smoothing WFNS ROC curve. Top left: the General tab, where data is entered. Top right: the details about smoothing. Bottom left: the details for the plot. Checking the box "Add to existing plot" allows drawing several curves on a plot. Bottom right: the result in the standard S+ plot device. In this case study we showed how pROC could be run for ROC analysis. The main conclusion drawn from this analysis is that none of the measured biomarkers can predict the patient outcome better than the neurological score (WFNS). In addition to the command line functions, a GUI is then available in the Statistics menu. It features one window for univariate ROC curves (which contains options for smoothing, pAUC, CIs and plotting) and two windows for paired and unpaired tests of two ROC curves. In addition a specific help file for the GUI is available from the same menu. A summary of the functions available to the user in the command line version of pROC is shown in Table 2. Table 3 shows the list of the methods provided for plotting and printing. The pROC package is a powerful set of tools analyzing and comparing ROC curves in R and S+. Unlike existing packages such as ROCR or verification, it is solely dedicated to ROC analysis, but provides in our knowledge the most complete set of statistical tests and plots for ROC curves. As shown in the case study reported here, pROC features the computation of AUC and pAUC, various kinds of confidence intervals, several smoothing methods, and the comparison of two paired or unpaired ROC curves. We believe that pROC should provide researchers, especially in the biomarker community, with the necessary tools to better interpret their results in biomarker classification studies. pROC is available in two versions for R and S+. A thorough documentation with numerous examples is provided in the standard R format. For users unfamiliar with programming, a graphical user interface is provided for S+. The authors would like to thank E. S. Venkatraman and Colin B. Begg for their support in the implementation of their test. This work was supported by Proteome Science Plc. XR carried out the programming and software design and drafted the manuscript. NTu, AH, NTi provided data and biological knowledge, tested and critically reviewed the software and the manuscript. FL helped to draft and to critically improve the manuscript. JCS conceived the biomarker study, participated in its design and coordination, and helped to draft the manuscript. MM participated in the design and coordination of the bioinformatics part of the study, participated in the programming and software design and helped to draft the manuscript. All authors read and approved the final manuscript.